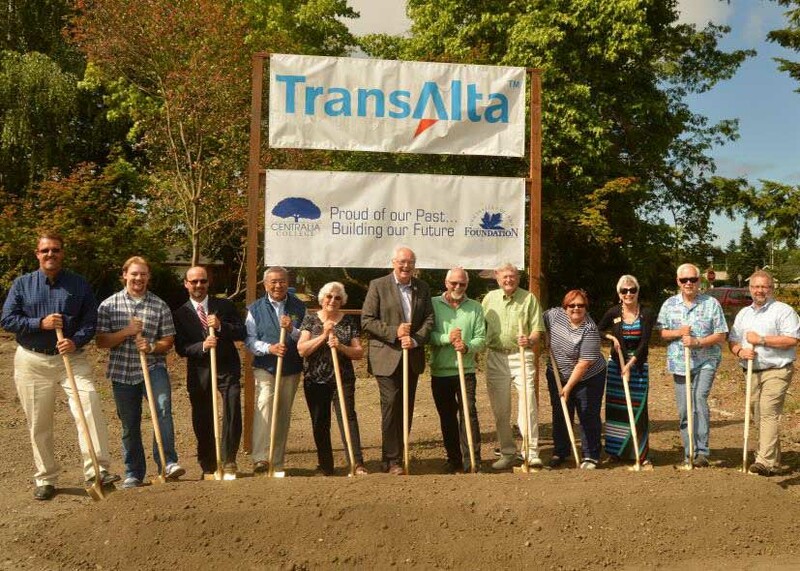 A crowd of more than 200 people convened at the corner of Pear Street and Washington Avenue on the Centralia College campus June 30 to break ground on the TransAlta Student Commons, a new building that will serve as a student center for the campus. “This is a momentous occasion. Today we celebrate the beginnings of something good,” said Centralia College President Dr. Robert Frost to the crowd of local and regional leaders, community members, college faculty and staff members, students, and college supporters. The president’s welcome included a long list of “star-studded” guests, including: the Centralia College Board of Trustees; former Centralia College president Dr. Hank Kirk; Rep. Richard DeBolt; Shari Hildreth, the district director for Rep. Jaime Herrera Beutler; Lewis County Commissioners Bill Schulte, Edna Fund, and Gary Stamper; Centralia Mayor Bonnie Canaday; Chehalis Mayor Dennis Dawes; Centralia City Council members; MSGS Architects; TransAlta Centralia managers; and Centralia College Foundation Board members. Recognizing the college’s key partner in a day of beginnings, Dr. Frost thanked TransAlta for its commitment to the college and community through its generous donations. “It is this culture of partnership and community that unites TransAlta and the college, and it’s what brings us here today to celebrate this very important beginning,” he said. Following Dr. Frost’s welcome, Chris DuPont, TransAlta Centralia manager of operations, shared a few words affirming the strong partnership with the college. Rep. Richard DeBolt then spoke of the importance of breaking the cycle of poverty in Lewis County through education. “College is a transition tool—the tool in our community tool box to make our children and citizens better… I am thrilled that this is being built,” he said. “We are deeply grateful to all of you,” Schwartz concluded. Distinguished guests then grabbed golden shovels to join Dr. Frost in breaking ground. As the first group lined up with shovels to take photographs, Dr. Frost invited everyone in the crowd to stay and take a turn at the shovel for a photograph. “This is an historic event, and we want to document it,” he said.